Earlier today saw the official weigh-ins for Sunday's "Ring of Diamonds card which saw all the fighters weighing in inside their contracted weights. The main talking point of the weigh in however wasn't the weight of the fighters by the new look sported by WBC Light Flyweight champion Adrian Hernandez (29-2-1, 18) who looked drastically different to the man who had been in Japan for the week or two. Hernandez, who will be defending his world title against Japanese youngster Naoya Inoue (5-0, 4) looked not only gaunt at the weight in but was also shaven headed, presumably doing what he could to make weight and perhaps showing that his frame is no long suited to the 108lbs weight class. Hernandez and Inoue, pictured opposite, both weight in at 108lbs making the limit perfectly. For Inoue the weight seemed like a breeze whilst Hernandez was showing his struggles with his face looking incredibly bad. The shaven headed look may have helped him under the limit but he certainly doesn't look like a fighter who is fighting fit. Another sign that Hernandez has struggled to make the weight is the fact he began to eat banana's almost as soon as he had made weight, as seen in the picture. We're expecting Hernandez to beef up significantly over night but big questions will be asked about just how much making weight has taken out of him. He should be experienced and have known how to make weight comfortably but this seems like a major mistake that could cost him, especially if Inoue attacks the body as widely expected. Issues with making weight can affect a fighter in numerous ways, including speed, stamina and punch resistance. If any of those hinder Hernandez then we'd be very surprised at the Mexican lasting the distance with Inoue who looked extremely strong at the weight. Despite the visible weight issues that Hernandez was suffering we haven't seen any changes in the betting with Inoue remaining a solid 1/6 favourite. From the pictures and details of the weigh in we'd tend to say those odds are very nice. Whilst Hernandez looked to have struggled immensely to make weight his compatriot Odilon Zaleta (15-3, 8) managed to make weight with some to spare. The WBC Flyweight challenger weighed in at 111¾lbs whilst defending champion Akira Yaegashi made weight bang on at 112lbs exactly. These two men weren't expected to struggle as both had fought at lower weights in recent years and although Yaegashi has filled out into a proper Flyweight he's still not a huge drainer compared to some other fighters in and around the 112lb weight class. For those wondering this will be the penultimate bout on the show. From the middle section of the card we're glad to report that both weigh ins went off with out a hitch. Roman Gonzalez (38-0, 32), sporting the cap in the picture, weighed in at 112¼lbs well inside the contracted 113lb limit whilst his Filipino opponent Juan Purisima (14-4-1, 4) was 112lbs exactly. 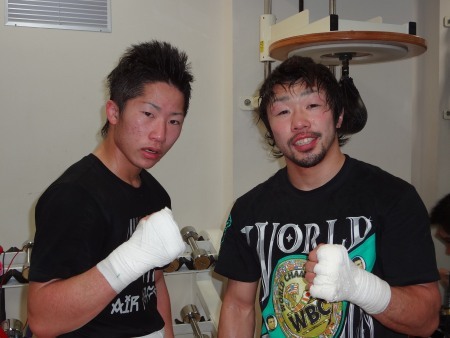 For the Japanese Featherweight title fight both men were again on weight. The experienced Satoshi Hosono (24-2-1, 18) weighed in on the limit at 126lbs whilst and Yuki Ogata (19-0-1, 3) was 125½lbs. Although Ogata is listed as the taller man it does like Hosono is about 1" taller than his unbeaten foe. For the shows opening bouts we again saw the fighters comfortably making weight. These saw Takuma Inoue (1-0) and Fahlan Sakkreerin Jr (23-2, 15) both weighing in at exactly 110lbs. Their bout, contract for 50KG's, is expected to open the show and is seen as a seriously huge test for the unbeaten Inoue who will be world ranked if he wins. The other fight, which is being fought at Bantamweight, saw Ryo Matsumoto (9-0, 8) coming just inside the limit at 117¾lbs whilst former world title challenger Hiroyuki Hisataka (22-11-1, 10) came in slightly lighter at 117½lbs. Despite the similar weights Matsumoto did tower over Hisataka by several inches as seen in the photo. We were informed earlier today that Naoya Inoue (5-0, 4) has had his WBC Light Flyweight title bout with Mexico's Adrian Hernandez (29-2-1, 18) moved to the main event of the up coming "Ring of Diamonds" show. Originally this bout, despite the huge interest, was set to be the chief support bout to Akira Yaegashi's (19-3, 9) WBC Flyweight defense against Odilon Zaleta (15-3, 8). Though an announcement made earlier this week has apparently seen the two world title fights switch billing on the card. 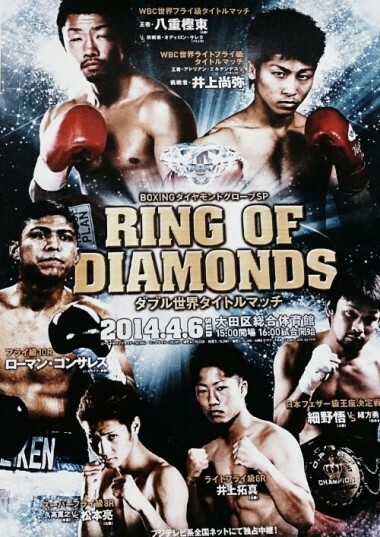 When "Ring of Diamond's" was announced we all knew Takuma Inoue (1-0), the younger brother of Naoya Inoue, was going to be fighting a world ranked opponent. What we didn't know at the time was who that world ranked foe would be. We had expected a fringe world ranked foe, one of those fighters who is ranked on the basis either a long unbeaten record against nobodies or a big win a few years ago. We had expected someone like Edwin Diaz (16-18, 5) who is ranked #12 by the WBC or someone of that ilk. What we hadn't expected is that Inoue would be going in against a genuinely respected opponent who is ranked by all 4 of the title organisations and who scored a major win just a few months ago. It's not someone like Diaz that will be fighting Inoue, instead it will be Thailand's Fahlan Sakkreerin Jr (23-2, 15). If you recognise the name that'll be because Fahlan stopped former WBA Minimumweight champion Ryo Miyazaki on New Years Eve in a stunning upset, one of the biggest upsets of the year. Prior to the "big win" Fahlan was already holding a world ranking, after the win however he was holding several and is currently world ranked in the top 10 by all 4 oraganisations. His best ranking is at #4 by the WBA though he also holds an IBF #5 ranking, a #6 ranking with the WBC and a #8 ranking with the WBO. To say he's highly ranked is to merely state the obvious. This is a huge test for the younger of the two Inoue brothers and although he has suggested that he wants a national title fight if he wins there may be serious thought put towards letting him fight for the a WBA title. A win over the #4 ranked fighter should guarantee him a very credible ranking and with both the WBA Minimumweight and WBA Light Flyweight titles currently sitting vacant the thought of skipping the national title to set a new national record must cross the teams mind. The bout, scheduled for 8 rounds, will take place on April 6th at the Ota-City Central Gymnasium. The card also include Naoya Inoue fighting for a world title, Akira Yaegashi defending his world title, the return to action of Ryo Matsumoto, a Japanese title fight and Roman Gonzalez. It really is one of those cards that every boxing fan should be taking note of and calling for similar shows to take place around the world.